The Scottish Lowlands is the part of Scotland not referred to as the Highlands. That is everywhere south and east of the Highland Boundary Fault, between Stonehaven and Helensburgh (on the Firth of Clyde). Geographically, Scotland Lowlands are divided into two distinct areas: the Central Lowlands, and the Southern Uplands. The southernmost counties of Scotland, nearest the border with England, are also known as the Borders. The Central Lowlands or Midland Valley is a geologically defined area of relatively low-lying land in southern Scotland. It consists of a rift valley between the Highland Boundary Fault to the north and the Southern Uplands Fault to the south. The Central Lowlands are one of the three main geographical sub-divisions of Scotland, the other two being the Highlands and Islands which lie to the north and west and the Southern Uplands, which lie south of the second fault line. The Midland Valley has fertile low-lying agricultural land and significant deposits of valuable coal and iron have led to the Central Lowlands being much more densely populated than the rest of Scotland. The major cities of Glasgow, Edinburgh, Stirling and Dundee all lie in the Central Lowlands, and over half of Scotland's population lives in this region. Looking east across Nithsdale to the Lowther Hills - from Cairnkinna in the Scaur hills. Grey Mare's Tail in the Moffat Hills from the Bodesbeck Ridge in the Ettrick hills. Source of the River Clyde (on the left of the picture) where the Daer Water (coming in from the top right) meets the Potrail Water (coming in from the midlle of the right side), The A702 and Glenochar Farmhouse are in the foreground. Glenochar Bastle and Fermtoun are just out of the picture on the bottom right - Lowther hills. Looking SSW over Loch Skene to Mid Craig (on the far side of the loch) and White Coomb beyond, from ascent of Lochcraig Head in winter conditions. Dungeon Hills and Awful Hand from the Saddle between Millfire and Corserine in the Rhinns of Kells. 01 Dungeon Hill - 02 Merrick - 03 Little Spear of Merrick - 04 Kirriereoch - 05 Mullwharchar - 06 Tarfessock - 07 Shalloch on Minnoch - 08 Hoodens Hill. The Southern Uplands is the least populated of mainland Scotland's three major geographic areas. They lie south of the Southern Uplands Fault line that runs from Ballantrae on the Ayrshire coast northeastwards to Dunbar in East Lothian on the North Sea coast, a distance of some 220 km (140 mi). The term is used both to describe the geographical region and to collectively denote the various ranges of hills within this region. 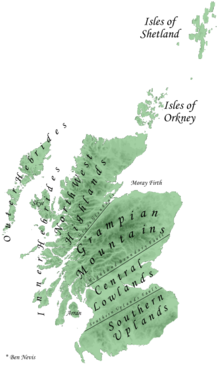 The Southern Uplands Fault  in Scotland is a fault that runs from Girvan (or more specifically from the Rhins of Galloway) to Dunbar on the East coast. It marks the southern boundary of the Scottish Midland Valley. ↑ McKirdy, Alan; Gordon, John & Crofts, Roger 2007. Land of mountain and flood: the geology and landforms of Scotland. Edinburgh. Birlinn. ↑ "Southern Uplands". Tiscali.co.uk. 1995-06-07. Retrieved 2010-02-26. ↑ "Education Scotland - Standard Grade Bitesize Revision - Ask a Teacher - Geography - Physical - Question From PN". BBC. Retrieved 2010-02-26. ↑ "Overview of Southern Uplands Fault". Gazetteer for Scotland. The Institute of Geography, University of Edinburgh. Retrieved 27 December 2009.